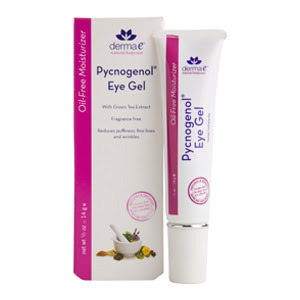 Pycnogenol® Eye Gel from derma e® is an oil-free moisturizing gel designed to gently penetrate eye tissue to fight the signs of aging by eliminating fine lines and wrinkles. The fragrance fee formula blends powerful antioxidants Pycnogenol® and Green Tea Extract to cool and heal the delicate skin around the eye while repairing and restoring damaged tissue and reducing under-eye puffiness. Derma e®’s Pycnogenol® Redness Reducing Serum blends potent antioxidants and anti-inflammatory botanicals including Pycnogenol®, to help alleviate irritations, nourish and moisturize skin and reduce blotchiness, flare-ups and discomfort. Designed with sensitive skin in mind, this fragrance-free serum is especially beneficial for individuals who suffer from Rosacea.